In ConsoleOne, browse to and select a user or a post office with users to whom the new Calendar Publishing Host will be assigned. Click Tools > GroupWise Utilities. 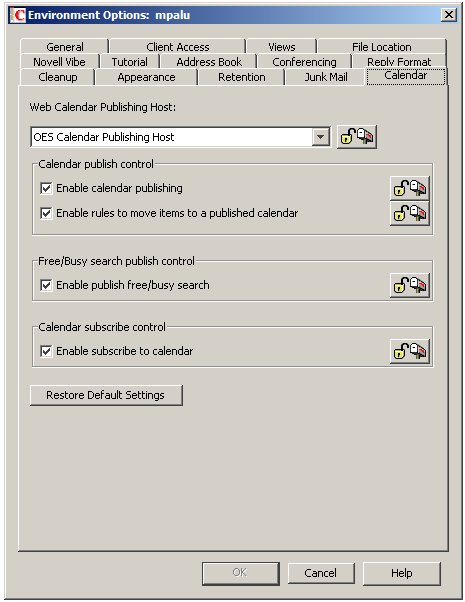 Click Client Options > Environment > Calendar. In the Web Calendar Publishing Host field, select the new Calendar Publishing Host, then click the Lock button to ensure that the new Calendar Publishing Host setting overrides the previous setting. Repeat Step 1 through Step 5 until you are finished moving users. Notify the GroupWise users to whom the new Calendar Publishing Host as been assigned that they need to notify their Internet colleagues of the new URL for their published calendars and free/busy information.